If you are planning a trip you might want to check out some of these amazing vacation rentals, which provide a great value and plenty of space for the entire family or a large group. But don’t wait too long, these prime properties tend to book fast, especially during the holiday season. How To Rent Out Your Property in Costa Rica – Try advertising here for less than .82 cents per day! Would you like to show your Costa Rica home to hundreds of our readers who are looking for rental properties in Costa Rica? If so, you won’t find another website that has more comprehensive information about Costa Rica real estate and nearly 25,000 VIP Members and a few of them are looking to rent a home in Costa Rica. Costa Rica Rental – 2,500 square foot home in Grecia available for 6 – 12 months. THIS HOME HAS BEEN RENTED. Searching for a comfortable private house for rent, in the country, yet with all the conveniences of living in town? This spacious 2,500 sq.ft. (233M2) two-level home in San Roque de Grecia is for rent, a couple miles (3 km) north of the city of Grecia – voted the cleanest town in Central America. Costa Rica Rental Three Bedroom/Two Bath House for Rent in Grecia – Central Valley. Lovely home for only US$1,400 per month. If you are considering Costa Rica as a retirement destination, this location will allow you to experience the rural Central Valley at its best. Daytime highs rarely hit 80 degrees F; nighttime lows reach about 60. Looking For A Peaceful, Tranquil Ocean View Villa For Rent? Look no further than Villas Alturas in Dominical. Only a few places on earth contain these conditions where there exists a beauty and energy that can be sensed the minute you cross the Baru River bridge into Dominical. Some say that what you feel is a spiritual energy, created from some unknown source, possibly from the ancient indigenous people who have occupied this territory through the millennium. If you are looking for sunshine, tropical climates and a friendly peaceful vacation. You must come to visit us in Sante Gertrudis de Grecia, Costa Rica. Rent Your Home in Costa Rica Fast With A WeLoveCostaRica.com Style YouTube Video. Now only $79 with special $20 discount for our VIP Members. 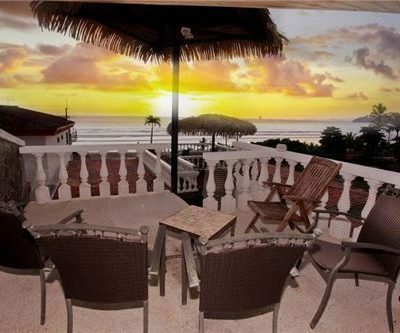 Ocean View Villa Vacation Rental in Central Manuel Antonio. Casa de las Cascadas from US$2,200 per week. Ocean View Villa in Central Manuel Antonio: A modern masterpiece of peaked roofs and glass walls, this rental home is like a vacation getaway for the Jetsons. This luxury villa is surrounded by tropical gardens, on 2.5 acres in a gated community. Luxury Ocean View Villa in Manuel Antonio. Villa Vigia from US$5,000 per week . Brand New Luxury Condo for Rent – Just minutes from Tamarindo, Hacienda Pinilla, Playa Grande, Playa Conchal, Brasilito, Flamingo and Potrero. Luxury, Balinese Villa Vacation Rental in Rainforest near Dominical. From US$10,000 per week . Luxury, Balinese Villa in Rainforest near Dominical Villa de Agua is a architectural masterpiece, and perhaps the most amazing vacation rental home on the Costa Rica’s Pacific coast. Lotus ponds, cascades, huge pool & jacuzzi, & open-air pavilion! How would you like to live right down the road from a “dazzling” national park? 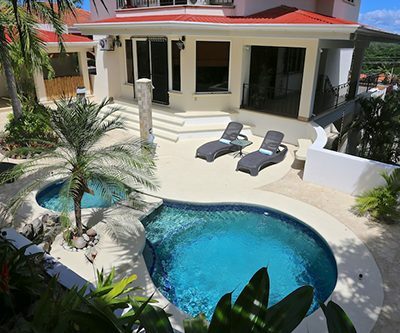 Manuel Antonio properties for sale are numerous and feature a variety of styles and amenities. Residents and visitors enjoy unspoiled beaches, incredible ocean views, entertaining nightlife, international dining, and an environment that screams “relax!” Oh, and did we mention that Manuel Antonio National Park is one of the 12 most dazzling in the world per Forbes Magazine? Three Bedroom Unfurnished Home For Long Term Rent in Liberia, Guanacaste – One year minimum please. The Luna Liberiana community has its own pool and children’s play area and is 5 minutes walk from the town of Liberia and a short 10 minute drive from Liberia International Airport.